Well actually just peanut butter time. 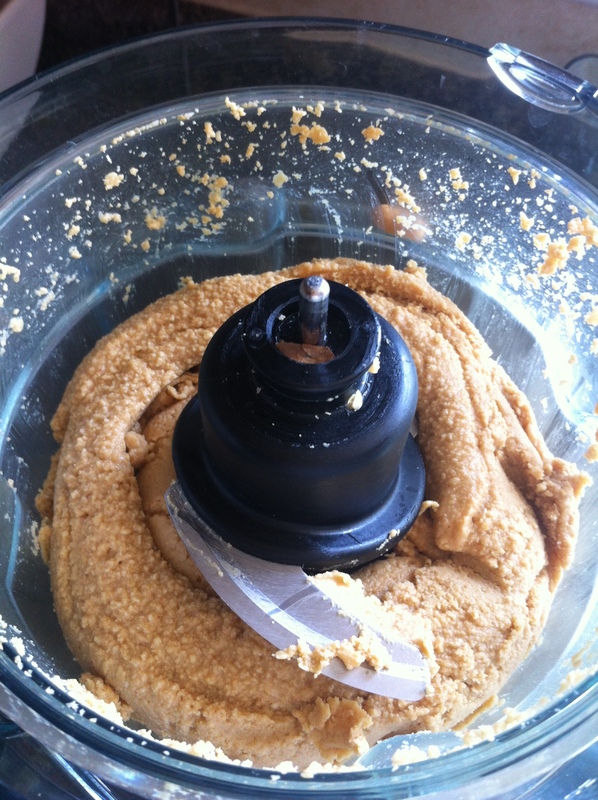 Yummy homemade peanut butter time! I found a recipe (if you can call it that since it’s one ingredient!) online. I guess you could call it more of a tutorial on how to make it. If you haven’t checked out her blog yet, you’re missing out! She has amazing recipes at Averie Cooks. We finally ran out of peanut butter. I bought peanuts about a month ago since I thought we were almost out of peanut butter… But it ended up taking weeks! Anyways the process was super easy and it tastes amazing. I don’t know if it’s because you know you made it so it tastes better, or if it really tastes better than store bought.. Either way I’m hooked. 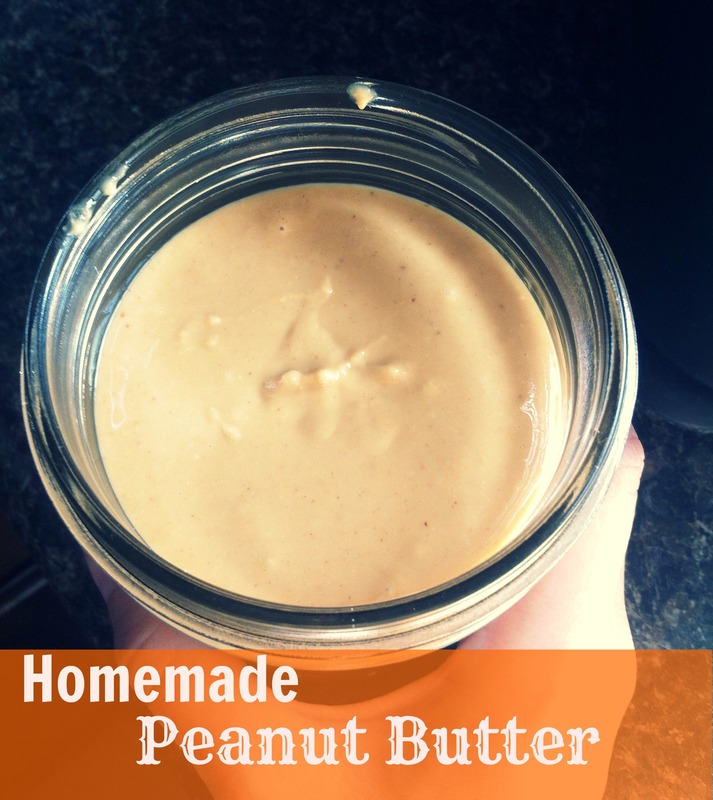 She also has recipes for other homemade butters which I plan on experimenting with around the holidays. Yes already Christmas planning! 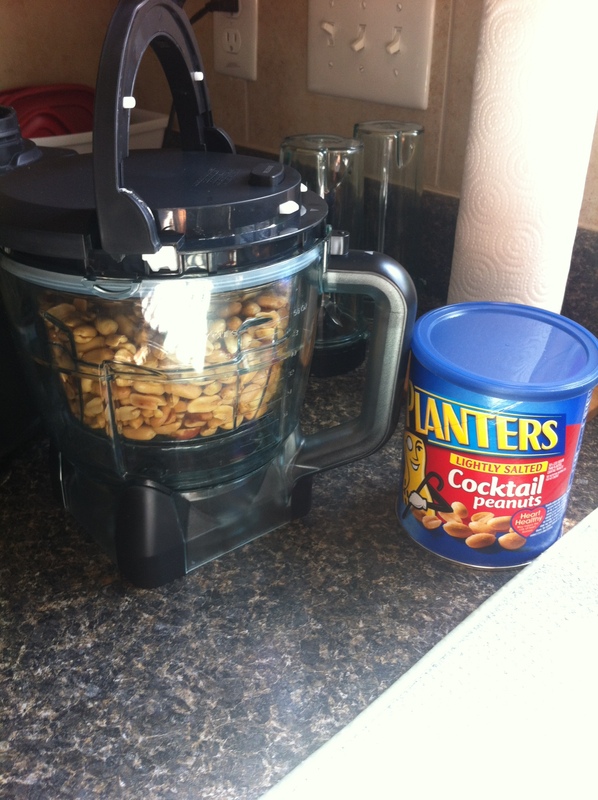 I used a 16oz can of lightly salted cocktail peanuts and my Ninja food processor. I didn’t add any additional salt or any other flavorings. According the the recipe the peanuts go through stages and can take up to five minutes of processing. First they get chopped up, then become really fine, then form like a peanut ball paste, then the natural oils break through and it begins to smooth out. At this point you can stop it when its the consistency you like. Maybe a little chunky or take it all the way smoooth. Which I did. I stopped and scrapped the sides down twice. 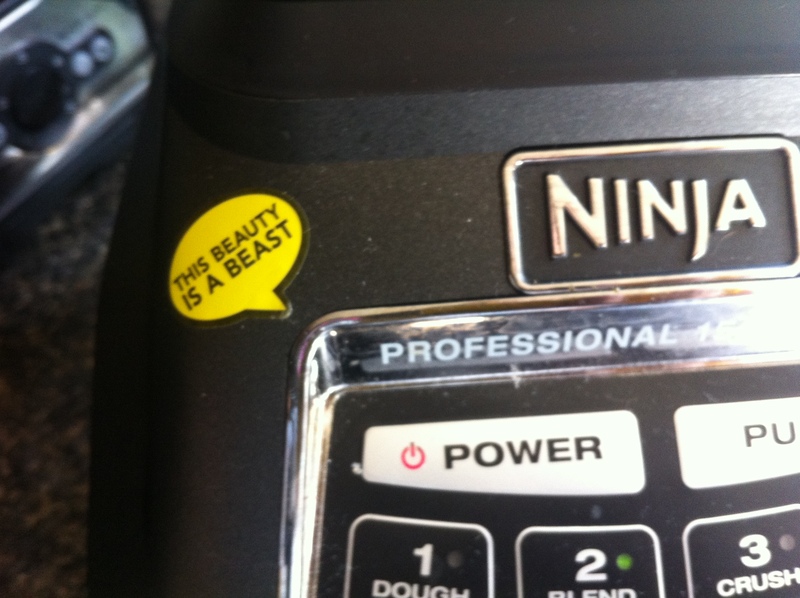 Thick, kind of pasty… Keep going! Now that’s how I like it-creamy. 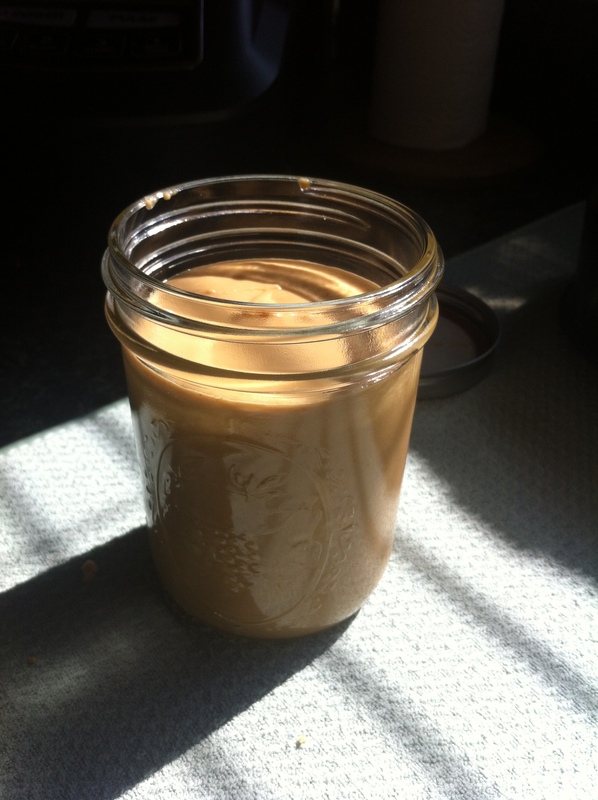 I made enough to fill an average size mason jar. Sorry I’m not sure of the exact ounces. I hope you take some time to make this, it’s soooo good! Love. A noun. A verb. A struggle. A beautiful thing. First let me say sorry this is so long. This is a pretty personal post to put out there but I wanted to share my opinions and experiences. Some things you might agree with while others you might argue against. Every relationship is unique and different. There are many experts, books, and articles out there with great advice about love and marriage. This is just my journey through my relationships, my marriage and what I’ve learned a long the way.. Relationships are amazing but they take work. You can’t expect not to have challenges and struggles even in the best relationships. You can’t go into a relationship hoping to ‘change’ or ‘fix’ someone. If the person you’re with can’t save a dollar they make, parties too much, has a wandering eye, or doesn’t want children don’t expect to come into their life and make them over. A person will change when they want to. It’s up to them no matter how hard you try. Same thing goes for marriage. My husband once said to me marriage shouldn’t change your relationship just your name. I truly believe this. If you are having problems, and I mean problems (not like he won’t put the toilet seat down) don’t think getting married will solve them! “oh after we’re married he’ll change”. If you go into marriage with that expectation you might be disappointed. Marriage. Big commitment. It’s not safe if you find yourself in love with marriage and not the person you’re marrying. That’s how hearts get broken. Planning the wedding, going on the honeymoon- all amazing. But the honeymoon phase does end and you’re left with every day life. So make sure that when the dust settles you’ll be happy with the person standing in front of you. 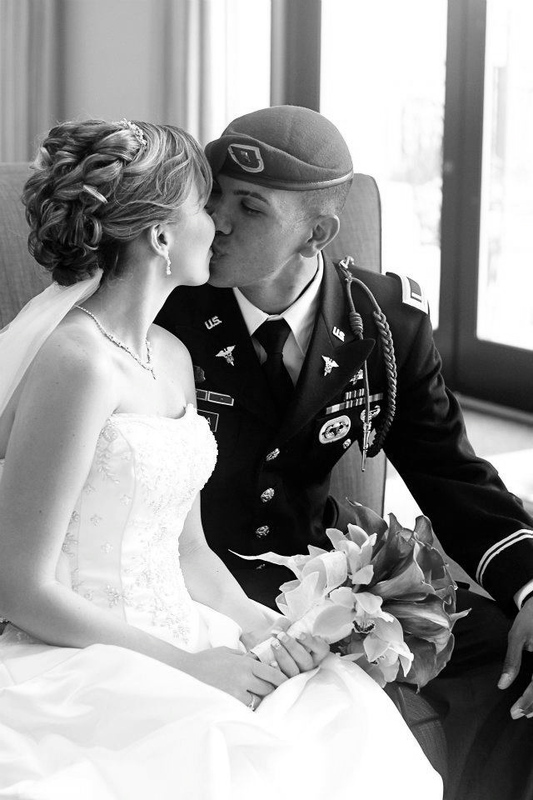 I went through my share of bad unsuccessful relationships, and I’d go through it all again to be with my husband. I don’t agree with the notion of not going to bed angry. Sometimes things are more clear in the morning light. I do believe in letting the little things go and picking your battles. Life is short– fight for what matters to you, not because he forgot to take the trash out or she left her makeup out on the counter. But importantly- through it all love each other. Appreciate each other. You might not like everything about them, but you should love everything they are. It should make you happy to see them happy. They should lift you up and encourage you to be the best person you can be. Because of my husband I finally got my AA degree. (8 years late!) To me a small accomplishment since most of friends have much higher degrees. But he even celebrated when I finished. It’s also important to be able to talk about difference without it blowing up into an argument. Which takes work. Don’t get discouraged. Right after we got married like clock work we fought every Sunday for about a month. Then one Sunday we didn’t. I was shocked. It never happened again. I still don’t understand why but it worked it self out. There will be nights when you turn away from each other, so expect that, and learn from your arguments. Marriage takes hard work but it’s a beautiful thing and worth the effort. I know my daughter will have heartaches and I’ll be right there for her, knowing that one day I’ll be standing at her wedding crying my eyes out- just like my mom did. If you’re still up for reading this is my love story. My story. For my husband. I was in about four serious relationships. One in high school and about three after. I was in a relationship for four years before I met my husband. A relationship that should of lasted maybe a month. However I didn’t use any of my own advice and I stayed, but I learned a lot. Of course there were good times but they by FAR didn’t out weigh the bad. I went into the relationship trying to change the person. I stayed when he didn’t treat me right. We didn’t want to see each other succeed. We didn’t communicate. We didn’t respect each other or trust each other. I think I stayed because I was afraid I’d never find Mr. Right. (Not a reason to stay in a relationship) So I was settling. But sometimes life doesn’t let you settle. I met my husband-we’ll call T, at work. We were friends at first, well more like acquaintances. T knew that I was in a relationship and completely respected that. We said hello when we saw each other but not much more than that. Then one day I don’t know what happened but its like my eyes opened up! I was extremely attracted to him. Ah! What do I do. Well after a string of incidences I made up my mind to get out of my current relationship. I just got to a breaking point. Finally, I was done. Unfortunately I had moved across the state to live with my ex and his family. So I planned on moving BACK to my parents house the following weekend. Money was tight for me and as much as I love where I moved to I couldn’t afford to live on my own. Well I saw T during my break and he told me he was commissioning into the army after he finished college… and I told him that was great! I also told him was moving back home. I kind of explained what happened and he offered to have lunch with me and see if there was anyway I could afford my own place. (how sweet) So we had lunch and came to the conclusion that living on my own was not an option. After lunch he asked me if I’d liked to go out to dinner. Of course. So he took me out to dinner- and swept me off my feet! He even offered to let me move into an extra room he had where he was renting. I was shocked. Excited. And nervous. I mean I did kind of just start getting to know him. But something told me to do it. (He confessed later to me that asking me to move in was the scariest thing he’d ever done, but also the best thing) My mom was not thrilled, but my dad was relieved that I was leaving my ex so he was pretty happy. Once everyone at work realized we were dating all I got were comments of how amazing he was, how he’s such a great guy! I’m glad he finally found a nice girl. I felt like I won the lottery. Now I realize that I did. We starting dating/living together in oct ’09. He commissioned summer ’10 and we were separated by the army for about 8 months, he got assigned a job and had to go to a school. I found out later he used this time apart to test me to see if I could handle the military life style. (which I had no experience with) Apparently I passed because he came home for a week in the middle of his time away and proposed to me. 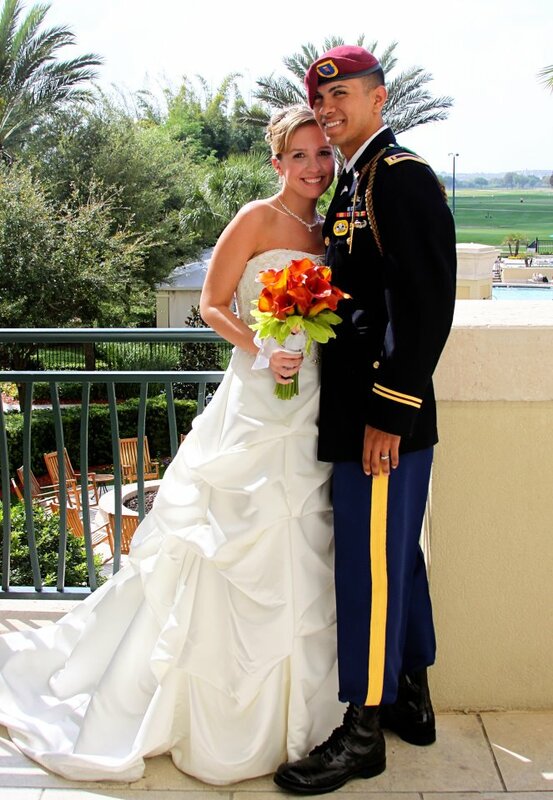 We got married in March ’11. We aren’t happy every minute of everyday but I am the happiest I’ve ever been before. He makes me a better person and I hope I do the same for him. He still gives me butterflies. I know we are fairly new to the married life but I think that we have created a great foundation and will continue to grow more in love every day. 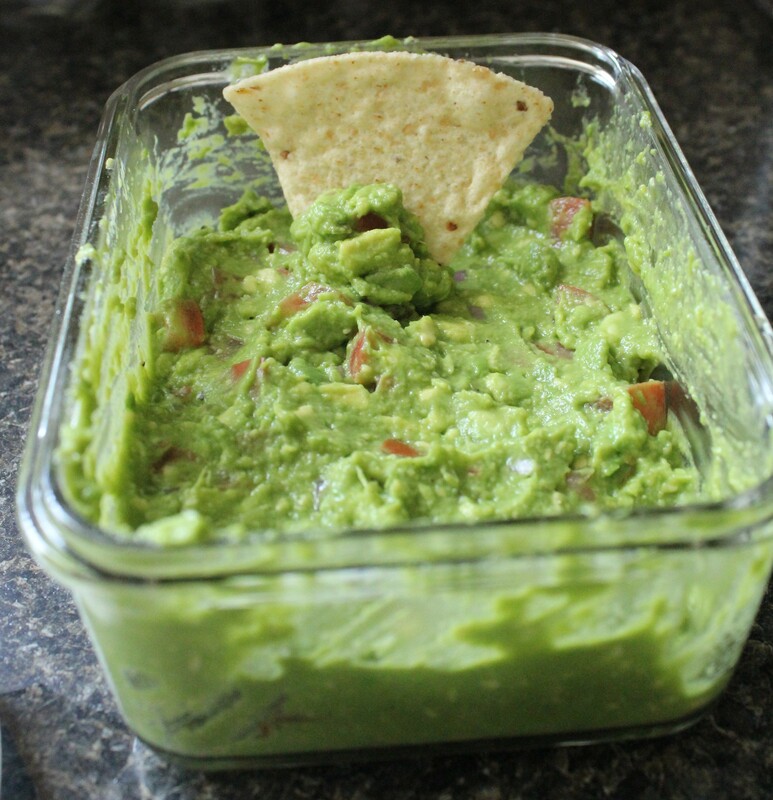 I love homemade guacamole. It tastes so fresh and yummy. My husband and I can finish this whole bowl on football sunday. It’s so simple it’s scary! Like many recipes you can adjust, omit, and add ingredients to your liking. 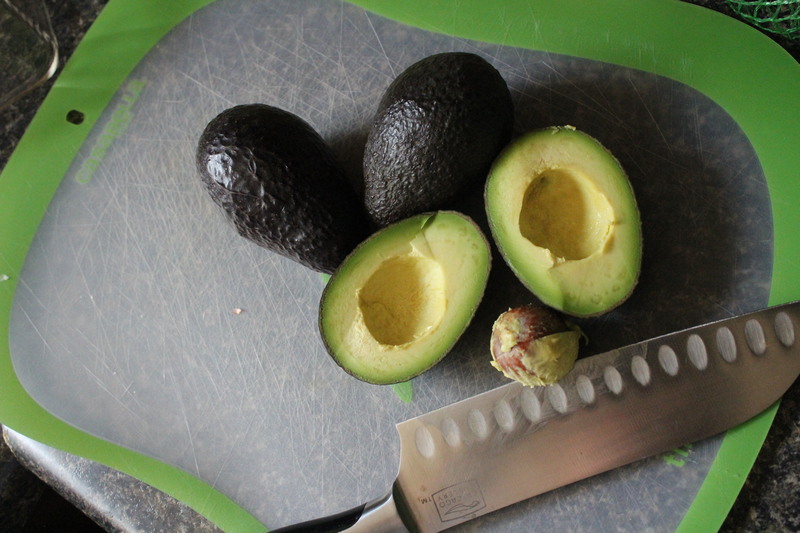 This is how I make it..
First you cut your avocados in half and take the pits out with the knife. Like this. After you scoop all the flesh into your container squeeze fresh lemon juice on top. I used 1 lemon and got about a Tbsp. 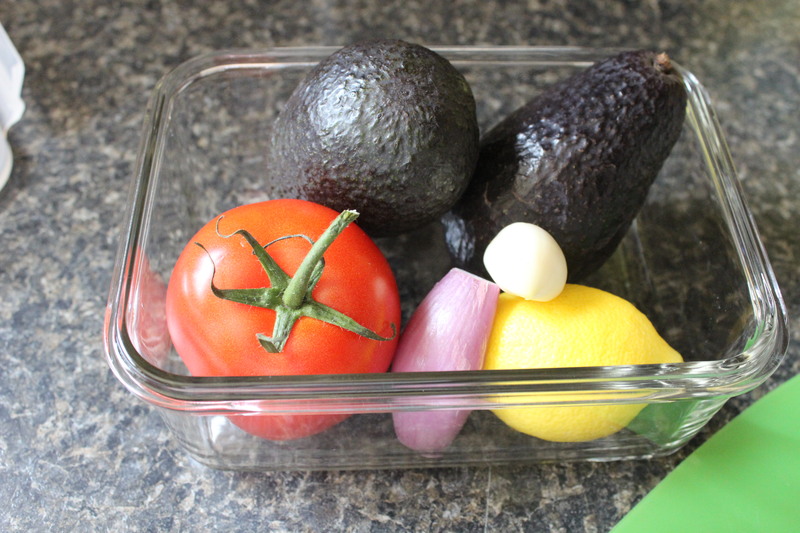 The citrus helps keep the avocado from browning. 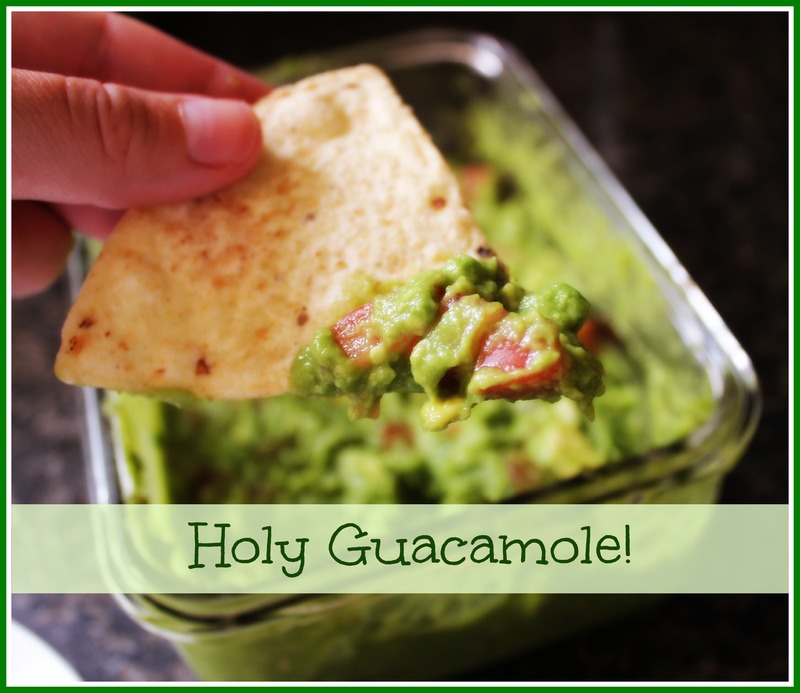 Typically you would use a lime, but all I had were lemons… When life gives you lemons make guacamole! Then smash the avocados till they are the consistency you like. I keep mine a little chunky. Add the rest of the ingredients. I love tomato in mine so I use quite a bit. I take the seeds and as much of the liquid out of the tomato. I grate my garlic in and slice up the shallot. Finally I add salt and pepper to taste. Salt makes a huge difference in this recipe because it helps bring out the flavors- but you can add too much! 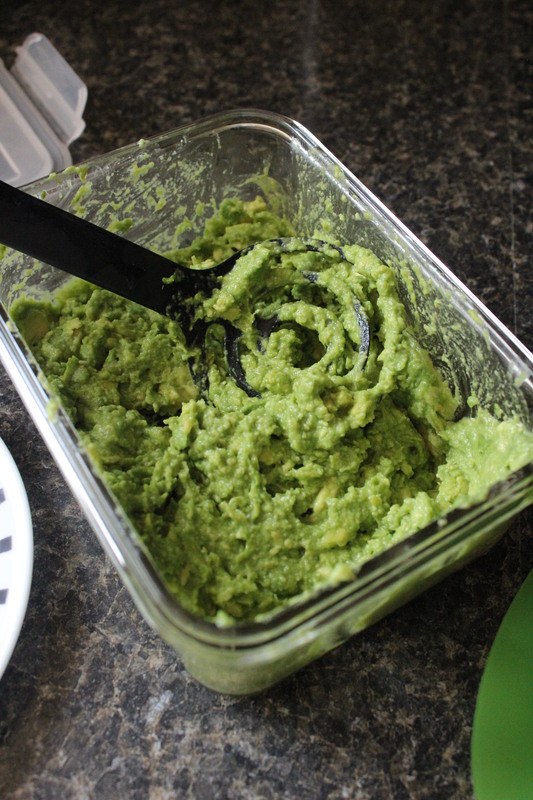 After I’ve mixed everything together I put the guacamole in the fridge for at least an hour to let the flavors blend, then taste it to see if it needs more salt. 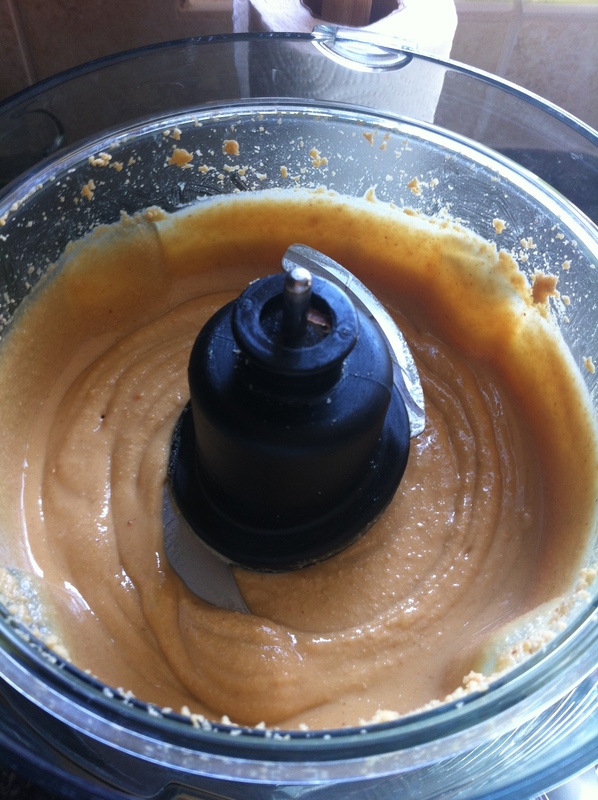 If you’re short on time you could put everything in a food processor and blend it up quick, I might omit the tomato and add that afterwards. Dive in! Try not to eat it all in one sitting! During our month of no spending I find myself struggling to be creative with dinner every night. Well one day I swear every channel on TV had pizza commercials! Needless to say I was craving a pizza. I haven’t had much luck making my own pizza crust at home or even using those pre-made ones in a tube from Pillsbury. Well I checked out the fridge and the freezer… Score! I had a package of Flat Out flat bread. I’ve made pizza on this bread before with left over shredded pork, cheese, and BBQ sauce. 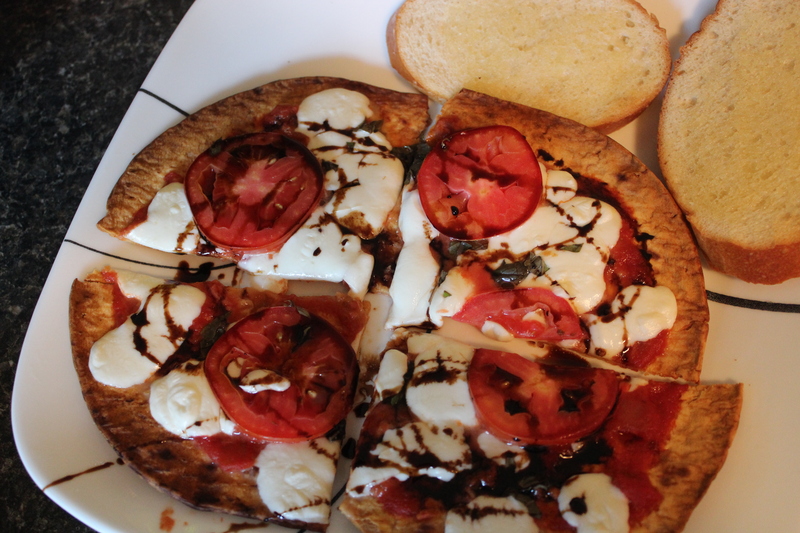 I really wanted a caprese inspired pizza. Luckily I had all the ingredients! The hardest part of this recipe (for me) was preparing the balsamic glaze. Sometimes I amaze myself in the kitchen with what I can make, and sometimes I surprise myself with what i can’t make! Balsamic glaze is really easy to make but for the impatient person it can be a challenge. All you do is put 2 cups of balsamic vinegar in a small pot bring it to a boil, lower the temp some and let it reduce. It will reduce by more than half. I’m not going to lie I’ve attempted to make it three times! Yes three. It’s embarrassing to admit. Well this time I did it! This post should be titled “I finally made balsamic glaze!”. Okay, so now that thats done you can assemble your pizza! prepare crust by brushing both sides with a thin layer of olive oil. You can sprinkle the toppings side with garlic powder if you want. This pizza is very versatile. If caprese isn’t your thing Flat Out Bread has a bunch of recipes! So our second week of no spending is complete. Yay! This is definitely getting harder. I think the hardest part of the challenge is the eating aspect. Cooking every meal every day has been tough! I try to make enough so that we’ll have left overs…but even then it’s the same thing. I also had to pay to get my wisdom teeth pulled which will be at the end of the month….! Ah I’m nervous!! And we had to pick up some shoes for our little one. I got two pairs for $7 at Once Upon a Child. She needs them for daycare, which she’ll be at when I have to get my teeth pulled…! Sorry I’m scared. Haha, but my husband will be there for four days to help me afterwards with everything. So happy were half way done! After I had Ava my weight dropped pretty fast. I did Insanity for about 2 months and got about 5 pounds away from pre-pregnancy. Insanity is a super hard program (hence the name!). When I moved up to round 2 after completely round 1 twice I about died. Much, much, much harder! well that was about 10 months ago… I’ve let the exercise thing slip for any excuse I can find. I managed to loose ever more weight (now below pre-pregnancy) but my muscle tone and body composition is in dire need of some attention. I want to be in the best shape I can be before we try for our next baby. That won’t be for at least a year or two. So yes, I have a lot of time but if I keep going at this rate it will never happen! So for my birthday in June I asked my hubby for two new workout DVD sets. I got Chalean Extreme and TurboFire. Chalean Extreme is a 3 phase system that is suppose to help build lean muscle and burn fat. I found a great review/breakdown on this blog. Reading this definitely got me excited to get started. I took down my measurements and weight. Honestly I’m not expecting to loose any weight; I might even gain some. But that weight should be muscle. I’m also going to do my best to record what I eat and how much water I’m drinking every day. I’ll be updating after each phase. Wish me luck! Wow so our no spending month did not go off so well! I did a big grocery trip to prepare for eating in for a month. Then we ran out of dog food. Then we ran out of milk that weekend for the baby… We just switched from formula so needless to say it was shocking at first how fast she goes through a carton of milk! Now I’ve armed myself with a gallon. My husband ran over a nail the day before the month started so we had to buy new tires. Then the internet kinda crashed on my computer. Awesome. So we had to purchase a new wireless router (which ours is about 5 years old anyways) But in the process of trying to figure out the problem we knocked our wireless printer off the network and we need the usb cord that I accidentally threw out thinking it was for the old printer… another $15 dollars! Not exactly how I anticipated the month starting. BUT we’re still going strong! despite all those set backs. We made some awesome sweet and sour chicken with veggie fried rice. It was great! and we made enough to have dinner and lunch for both of us for two days. Can’t beat that. I also made an eggplant lasagna, modified a little. A great recipe and dinner for two nights! I hope the rest of the month runs a little smoother! It’s a Guac Pa… on My Weapons! 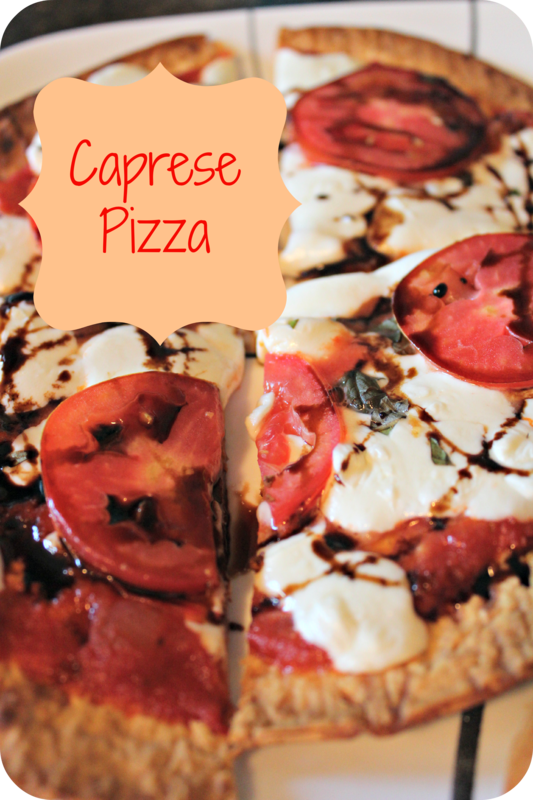 Caprese Pizza | For… on A Month of NO spending…. Week One…. 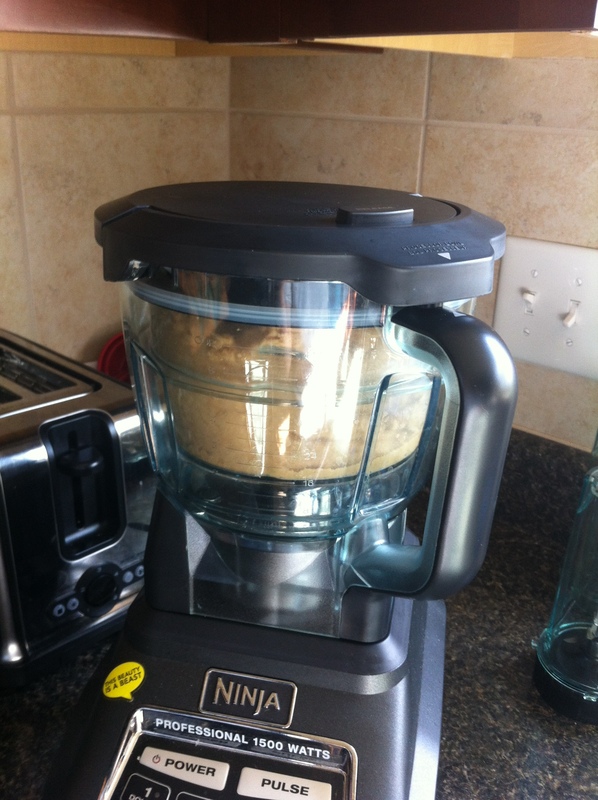 | F… on A Month of NO spending…. Christina on Baby Girl is almost 1!